"This tells me that ALL 1967 and 1968 Camaros ordered with Z21 or Z22 got the same exact molding." "...but according to the AIM's, for production, there was only one set for the fronts." 1968 Z22 (Rally Sport) - Got the "short" moldingS as shown in the lower pictures. '68 RS only. By now Allen is probably sorry he asked! That's because this all got me so confused I didn't know what was what!! I had to go back and re-read everything several times before I could hash it out. And the original dealer pictures I just posted made it easier for me. This is good discussion guys but I think you took over my question. I wanted to know about the REAR wheel well moldings on NON-RS cars? Are both short and long trim types correct? Some NON RS cars have the short version ( look at Darrel Cook's Rally Green L78 in the original cars section). But I have also seen NON-RS cars with the long version for the REAR trim molding. That is what I wanted to know. However, I did find the discussion to this point interesting as well. Please help me answer my original question. Allen, the rear moldings were used on both the Z21 and Z22 cars, and terminated at the top of the rocker panel as shown in the picture in my reply #4. Some NON RS cars have the short version ( look at Darrel Cook's Rally Green L78 in the original cars section). Allen look at the thread again. He did not originally order the car with the Z21 package. Also you can not add Rinsor's 68 to the list either as it too was a non Z21 option car but had the wheel well molding added after. Dave's 68 Z with Z21 option. As for the rest of the conversation.. I'm staying out of it. Holy buckets Darrell, that is a huge pic! To Ed, thank you for the clarification on the rear wheel well moldings (I went back and reviewed your reply #4). That answers my question completely and I appreciate it. So - it is correct for my non-RS L34 to have the short rear wheel well moldings. Yeaaa! To Darrell- I should have looked at your car thread a little closer. I very much appreciate you correcting the record and letting me know about that (I did not notice the early pictures did not have the trim Z21 option). BTW, I love your car - that color is great on 68's. Also thank you for correcting the record on "Rinsor's" car as well because I thought it was a completely original reference. Are there any other upgrades or non original changes to that car that I should know about. This FORUM is absolutely fantastic. Thanks again to everyone for the help and great info. OOOPs. I also meant to thank "Rare396bronze" for definitive statement on the rear moldings as well and other participants too. Not me. I just copied and pasted. Allen, I do not know of anything on his car that isnt original. That was just my observation. Not bad mouthing his car as its a better specimen on originality than anything I have just noticed the well moldings were for an RS. Right or wrong its still an amazing car. And thank you for the comment. I'm kinda partial to the car. Yea, blame me Darrell as I'm the one who posted Skip's pic's. It was not that big when I posted it. LOL I think the system (CRG) automatically downsized it when loaded so I guess it is my fault for now until photobucket cancels 3rd party when my grandfathering is lost. Agree with the info shared by William and company but to assist with Allen's question IMHO the answer is yes, both are acceptable. Our 68 non RS car came with RS rear wheel mouldings, and that is what I put back on. 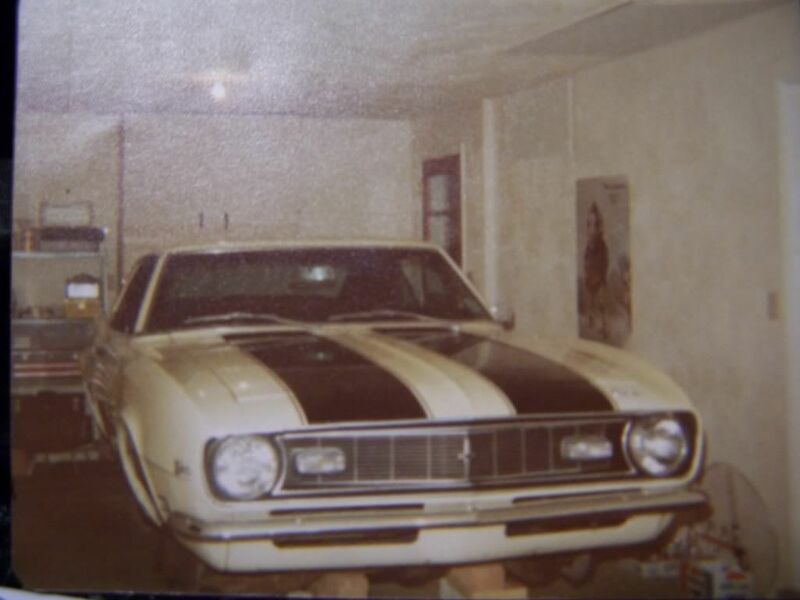 I've noted other original survivor type cars with the same and when I asked JerryM at his place around 2010 about it he told me to look at his 68 survivor as its the same. So - it is correct for my non-RS L34 to have the short rear wheel well moldings. Yeaaa! I don't think that's a correct reading of the information. Your references for short non-RS rears just got shown to be cars that had the trim added. I have been doing Chevrolet part's for 31 years. I get my information from original gm parts books. All 67 Camaro's on the rear took part # 4229494 & 4229493 which was went always the way down the front of the rear quarter. All 68 Camaro's took part # 7795064 & 7795063 which was shorter at the front of the quarter's. I just checked my Chevrolet part's which was dated may of 1968 & also my December 1968 . I also have old Chevrolet ad's picture's that show a 1968 Camaro SS non rally sport & 1968 corvette. The Camaro rear wheel was short on the front. Have also have a picture of me in May 1968 in front of a 1967 Rally Sport it's rear molding was long. I would keep what you have on there because it is correct. Old ad's are your best source. You can find them at swap meet's & Ebay. I have sold hundred's of the Camaro wheel molding's and have never had a customer complain. Hope you have a Merry Christmas and enjoy your Camaro. I just dug on this and I'm tending to agree with Rare. 68 fronts had 2 different pairs of part #'s. RS and non-RS. The 68 RS parts were discontinued by July 69 (serviced by just cutting off the long ones). The 68 rears only had one pair of part numbers for all models. The parts books are pretty clear on this, even the early 68 parts book. What do the road tests show for the rear moldings on non-RS cars? Ads are a poor source of data, btw. The cars are often not indicative of production. Which is exactly what I said in the very first reply! Allen, the rear moldings (P/N 7795063 and 7795064) are for all 1968 Camaros, Rally Sport or not. Only the fronts are different. Which leads to more confusion because the parts manuals contradict each other! One will say "WITH RS" while another will say "WITHOUT RS" for the exact same part number!! However, the front RS moldings are shorter because of the side trim (the "spear"). The 1968 rear moldings (P/N 7795063 and 7795064) are for all 1968 Camaros, Rally Sport or not. Only the fronts are different. For 1968, the front RS moldings are shorter than the non-RS moldings. Really had to do some digging. Here's a '68 Nickey Camaro promo photo. No idea of the source; Nickey closed in the early '70s. Looks like the rear molding ends near the rocker spear. Based on the stripe the car was built prior to January 1968. Dug out copies of '68 Camaro body trim from the illustration index in the 1/1/68 P & A book. Only one rear wheel well molding is listed; 7741686 & 7741687 [L & R]. At the front, 4 part numbers are listed designated 'RS' and 'exc RS'. Conclusion: I stand corrected. It appears Chevy intended to and built '68 RS and Z21 Camaros with the clipped rear wheel well molding. Other pics are inconclusive. I did find a feature on a special paint '68 Z/28 in the January 1973 Super Stock. It is a style trim car and has the clipped rear molding. FWIW I did find a Chevy promotional pic of a '68 Camaro and it shows a full-length molding. Looks dumb to me but apparently built that way.